The Mansfield Historical Society is having its Museum Opening on Sunday, June 4, 1:30-4:30 p.m.One of the new exhibits celebrates the centennial of scouting in Mansfield. To introduce the exhibit, Boy Scout Troop 56 will set up a camp on the museum grounds and provide demonstrations throughout the afternoon. 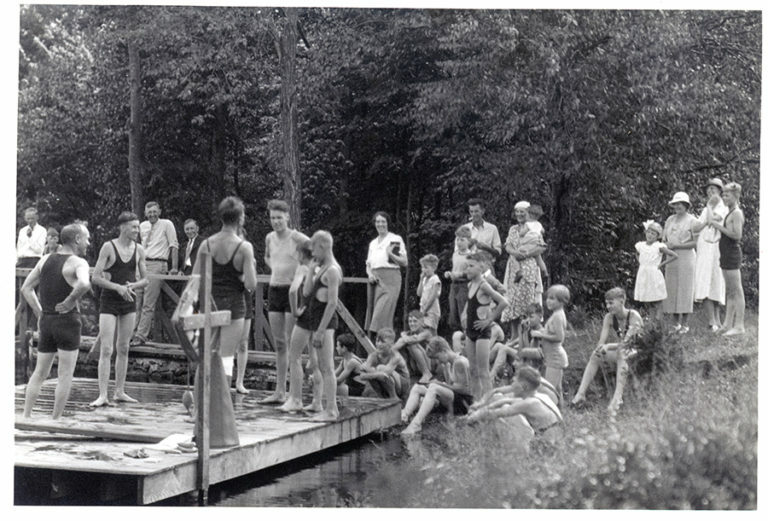 Boy Scouts enjoying summer camp at Camp Quinebaug during the 1930s. The photograph was taken by Jerauld Manter. The first Boy Scout troop in Mansfield was started in 1916, just six years after the formation of the Boy Scouts of America. Designated Troop 1, this troop was chartered out of New York because it predated the formation of the first Council in the state of Connecticut. The troop later became Troop 26, then in 1936, became Troop 56, which it remains today. Other troops were also chartered in Mansfield: Troop 60 (1938-1972), Troop 61 (1941-1972, 2002-2015) and Troop 91 which formed at the Mansfield Training School in 1945. The exhibit showcases the history, activities and service projects of these Boy Scout troops, as well as the local Cub Scout packs, Explorer Scouts and Venture Scouts. A plethora of photographs, artifacts and memorabilia are on display spanning 100 years. Troop 56 Scoutmaster Louanne Cooley and Assistant Scoutmaster Keith Wilson have prepared this exhibit. A second exhibit commemorates the centennial of World War I. “Mansfield during the Great War” explores the effects of the war on the local community as well as the contributions of its citizens and the Connecticut Agricultural College to the war effort. As a land grant college, C.A.C. played a major role in the coordination of the State’s food production and conservation efforts and also served as a training site for troops. The exhibit also features period information on food preservation and conservation. Through propaganda posters and publications, the U.S. government urged citizens to plant vegetable gardens, can their produce, and cut their use of wheat flour, sugar and other food products that were in short supply due to the war. In conjunction with this display, the store exhibit has also been updated to reflect the World War I era. A third exhibit focuses on the Farwell house, now gone, and the archaeological investigations of its site. This exhibit is a collaborative project of the Mansfield Historical Society and the Connecticut State Museum of Natural History. On November 27, 1976, the 18th century Farwell house was burned by the University of Connecticut as a fire training exercise. Twelve area fire departments participated in the day-long drill. The house which had stood for some 220 years was gone in a few hours. This action ignited a firestorm of protest within the community. The 19th century barn associated with the house was placed on the National Register of Historic Places in 2001 and has since been restored. It remains a landmark at the intersection of Route 195 and Horsebarn Hill Road. The KAST (Kids Are Scientists Too) archaeology field camp has been conducting digs at the Farwell house site since 2006. The exhibit includes examples of their discoveries at the site. The artifacts span from prehistoric times to the 20th century. Following the opening, the Mansfield Historical Society Museum will be open every Saturday and Sunday, 1:30 – 4:30 p.m. through the end of September. Admission is $2.00/adult; free for children and MHS members. The museum is located at 954 Storrs Road (Route 195), across from the First Baptist Church. On opening day, additional parking will be available at the church.